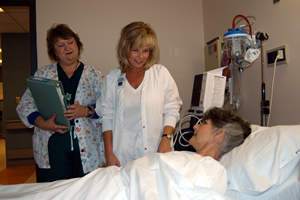 The Day Surgery Unit at Coosa Valley Medical Center was established to meet the unique needs of patients undergoing surgical, endoscopic, or pain management procedures. The Day Surgery Unit is a caring and comfortable environment where you can have certain operations and procedures performed and go home the same day. There are many surgical procedures that can be done on an outpatient basis, cholecystectomy, appendectomy, tonsillectomy and hernia repairs, to name a few. Our experienced, friendly staff is dedicated to delivering processional compassionate care to you and our family. Our patient population ranges from pediatrics to adults, and we do our best to tailor our care and services to meet each patient’s unique physical, social and cultural needs. Let us provide you with First Class Care, right here in your own home town.